My Mom knew Sim and I had been having a bit of a tough week, what with him being booked off with a nasty sinus infection and me being a bit stressed-out with work and whatnot, so she went all out with her very first, homemade chicken biryani - one of my all time fave comfort foods! Her friend, Roslyn, was consulted for guidance on the general rules and ingredients of biryani-making. According to her: "You need to put lots of spice. The secret's in the spice" (thanks, Ros). Cut the chicken breasts into chunks and rub with masala and salt. Set aside (in the fridge). Put the rice on to boil (follow packet instructions) with the rice spice and salt. In a seperate pot, put the brown lentils on to boil (follow packet instructions). Once they are cooked, add masala to taste. Peel and cut the potatoes. Boil in a third pot with salt till soft. Fry the onions, garlic and ginger in olive oil over low heat till translucent. Add the chicken and cook till done (my mom added some of the boiling water from the lentils and potatoes), adding salt/pepper/masala to taste. 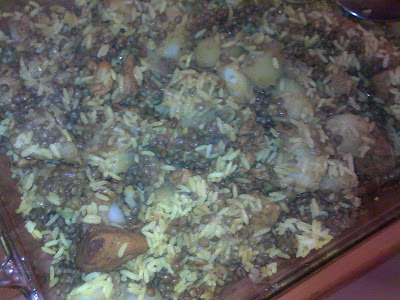 Assemble the biryani by layering rice - lentils - potatoes - chicken - rice (apparently boiled eggs are also an optional extra). Cover with tin foil and pop into the oven to steam (about 175 degrees Celsius for about 20 minutes). Take out the oven and sprinkle with freshly chopped coriander (dhania) (if you can handle the taste, which I can't). 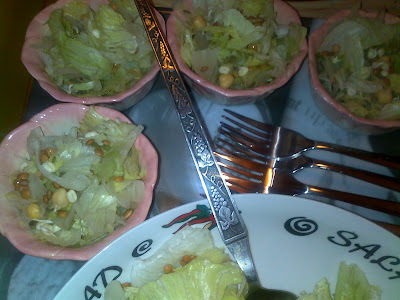 Mom served this delicious biryani with a simple side salad of lettuce and sprouted legumes/lentils. I hope you all have a great week, filled with nourishing moments and good food. I agree, nothing beats a good biryani! 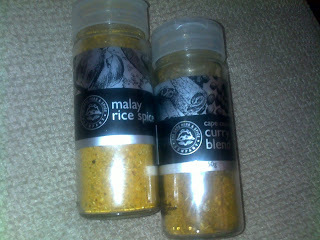 I am also relieved to see that you can use a spice mix as well! Lenore: Ta - me too! Your blog has the best name ever. Also, your chicken looks incredible. I'll have to track down those spices. Catherine: It's time-consuming to make but SO worth the effort! Robyn: Cool! I saw one of YOUR recipes on the petit chef menu for the day the other day too. Never read that series, but I'll check it out at the EB. Travis: Thankee kindly :-) I'm a total Highlander geek at heart, and my older brother used to tease me mericlessly about it by jumping out from around the corner with my excalibur (a gift for my 21st birthday), exclaiming: "There can be only Juan!"